What would be the cost of a system including multimedia equipment (projector + screen)? The final price of such a system is influence by a number of factors, the most important being: ambient room conditions (brightness, light intensity), size, parameters and class of presentation equipment. A basic system with an electric remotely controlled screen and multimedia projector in a classroom sized 5x8 m and height 3 m would cost approximately PLN 3,000. The modern solution in the field of interactive equipment. An indispensable solution during training sessions, in teaching, during presentations and meetings. The latest interactive boards are new generation equipment based on advanced technology. Such boards offer high picture quality and unique software functionality. The purchase of an interactive board is an investment in a first class, genuine product at an affordable price. The board allows an improved efficiency of communication. As a result, communication becomes more efficient. We have a multimedia projector, which is used by many employees, and we have already replaced expensive lamps several times. How can we improve its utilization? The best solution is to mount the projector permanently to the ceiling. In this way the projector will be optimally positioned in relation to the screen and the presentation is displayed immediately after the computer is connected. Frequent replacement of lamps in the projector probably results from immediately switching off the projector after a presentation: it is recommended in most projectors that the lamp be cooled down and the projector switched off only after cooling. Mounting projector under the ceiling entirely eliminates this problem. The projector is permanently connected to the network and it is cooled down and switched off automatically. Is wireless communication between projector and computer possible ? Yes, such communication is possible. There are many models of multimedia projectors equipped with WiFi wireless communication connection. 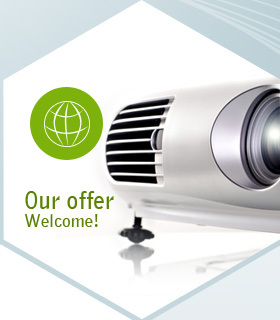 If you already have a projector which does not have such a solution, we can optionally equip it with A special WiFi wireless communication module installed in VGA connection. Such solutions work in particular when you want to avoid using cables. It allows the aesthetic looks of the room to be maintained. In addition it offers an opportunity to connect up to 4 computers at the same time.